IMG – (Left to Right) Kabir Bhakta, Nicholas Benson, Abby Tolbert, Michael Shortancy, Pavan Patel, Sarina Alvarado, Zen Lister. Team Gemini 14806 competed at FTC State Robotics in Lubbock. Gemini is a first year FTC team and consist of four eight grade students and two high school veteran FTC members as their mentors. 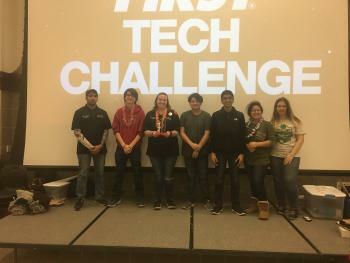 They brought home the Rockwell Collins Innovation award, this award is based off of a series of engineering interviews allowing the team to discuss and share their design challenges and success through the engineering process. Gemini 14806 will not advance further than the state level this year, they have big plans to enhance their engineering designs for next year and grow their experiences through FTC.